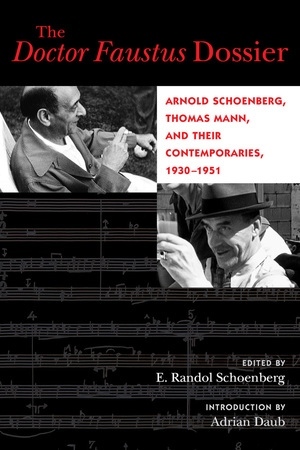 Arnold Schoenberg and Thomas Mann, two towering figures of twentieth-century music and literature, both found refuge in the German-exile community in Los Angeles during the Nazi era. This complete edition of their correspondence provides a glimpse inside their private and public lives and culminates in the famous dispute over Mann’s novel Doctor Faustus. In the thick of the controversy was Theodor Adorno, then a budding philosopher, whose contribution to the Faustus affair would make him an enemy of both families. Gathered here for the first time in English, the letters in this essential volume are complemented by diary entries, related articles, and other primary source materials, as well as an introduction by German studies scholar Adrian Daub that contextualizes the impact these two great artists had on twentieth-century thought and culture. E. Randol Schoenberg, the grandson of the composers Arnold Schoenberg and Eric Zeisl and the winner of numerous awards in the field of litigation, is an expert in handling cases involving looted art and the recovery of property stolen by the Nazi authorities during the Holocaust. Adrian Daub is Professor of Comparative Literature and German Studies at Stanford University and the author of Four-Handed Monsters: Four-Hand Piano Playing and Nineteenth-Century Culture and Tristan's Shadow: Sexuality and the Total Work of Art after Wagner.